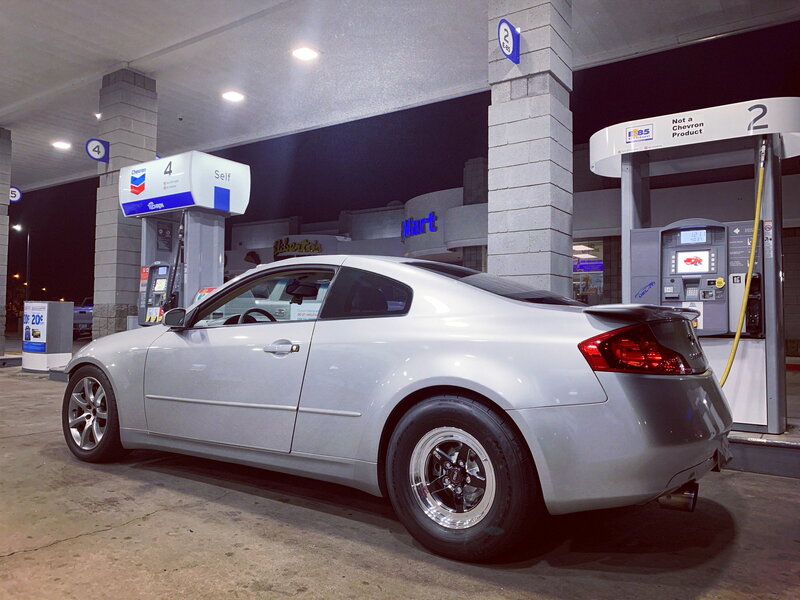 Finished throwing a pair of 15" Weld RTS S71's on my G35 Coupe, figured I'd post a little info on how I went about it since I wasn't able to find any info on it previously. Car was originally an OEM Brembo car so I had to install base model brakes onto my car first. Onto the wheels, I ended up purchasing Weld RTS S71's in 15x8.33 w/5.5" of backspacing. As for tires I went with 275/60/15 Nitto 555R's. With these wheels and tires I didn't need to cut or roll fenders, etc. For what it's worth, I definitely wouldn't recommend this setup to anyone making less that 500whp or so. Last edited by thatv35guy; 02-07-2019 at 11:38 AM. What did this 15" wheel/tire combo end up weighing (per wheel)?